I might not be a domestic goddess and I don't often post recipes on the blog. But that does not mean I don't cook for my family. Before I went to Sweden, I could only whip up instant noodles and at most, fried rice. Four years of training on that land has helped me adapt to the kitchen and it now becomes stress-free to cook 3-dishes-1-soup. But no, in case you are thinking fwah, she's a crazy mum, I must tell you I cook relatively simple, straightforward and can't-go-too-wrong dishes most of the time. One thing I have always been quite concerned for my family is healthy eating. So, I make it a point not to use any MSG and also refrain from using processed food or artificial flavourings as much as possible. If not for my own personal liking for fried food, I might even try to abstain from frying anything in the kitchen but let's just say that will be plain torture for the taste buds. 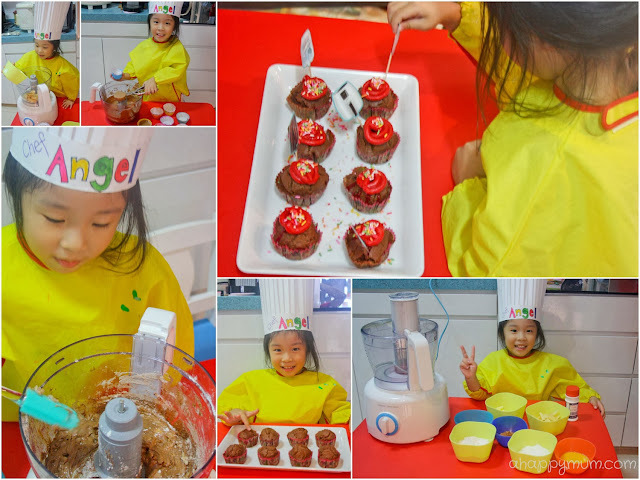 With the Philips Avance XL Airfryer which works wonders in the kitchen, read about Chef Angel's cooking adventures here, I feel empowered, energised and enabled to make healthy yet tasty food for the family around-the-clock. I remember my friends and I loved to make this for class gatherings in secondary school. Easy, quick, fuss-free and most of all, yummy! Teenagers love it, adults love it and kids love it too! All you have to do is spread tomato ketchup on a slice of white bread with the crust removed. 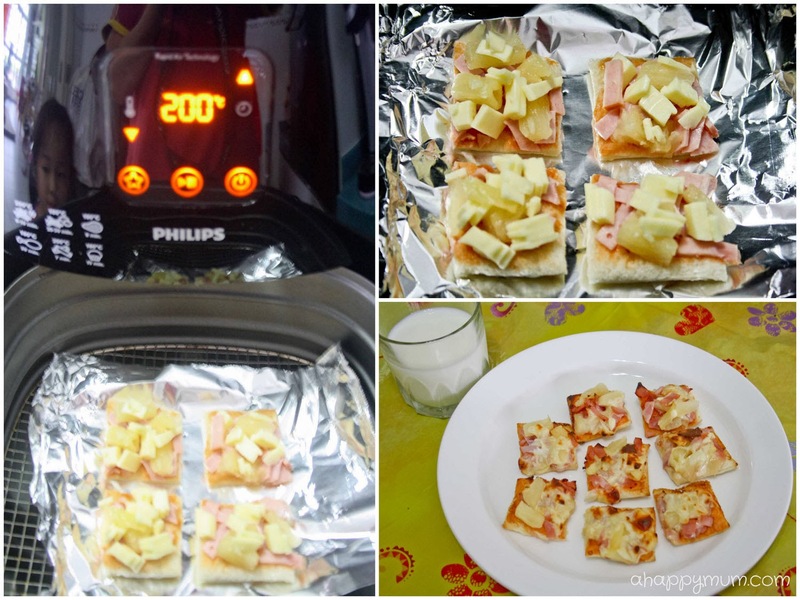 Put finely chopped cheese and ham on top together with small pineapple pieces. Chop into four quarters. Airfry at 200°C for 6-8 minutes. I love how the bread turns out crunchy and the melted cheese makes the toast taste heavenly. 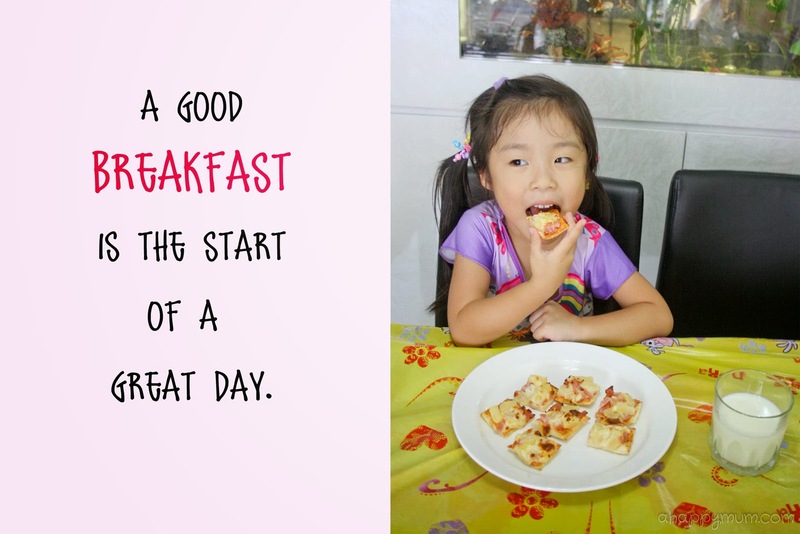 Serve with a glass of milk and this is the perfect breakfast for the family to enjoy. If you have not tried it, it is actually not that hard to debone a chicken wing. All you need is a pair of sharp scissors and some brute strength to cut the tendons, scrap the meat and remove the bones. This video shows you how to do it and with a little practice, you can easily finish a wing under a minute. I did these with a baby slung on my chest, so if I can do it, you definitely can. For the wings, I marinated them with light soy sauce, sesame oil and a dash of pepper. For the stuffing, you can use anything you like, even the fried rice can be used which can be a great way to get the kids to swallow more grains. My personal favourite for the filling is coarsely chopped prawns with finely chopped mushroom and water chestnuts - marinated with Shaoxing wine, light soy sauce, pepper and sesame oil. Once you have stuffed the chicken wings, seal the openings with toothpicks and airfry at 200°C for 10-15 minutes. 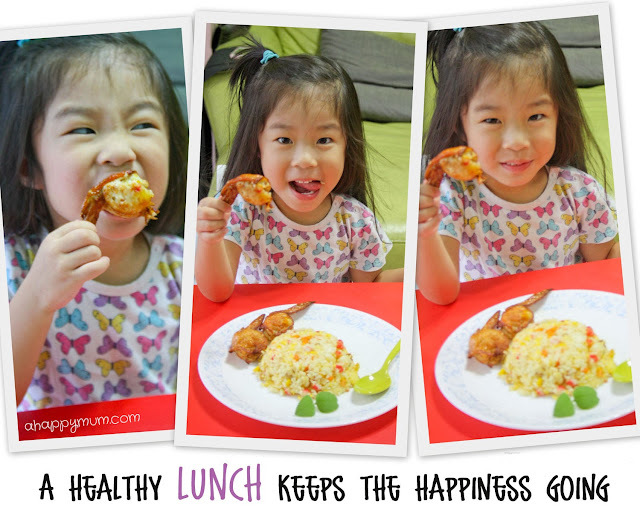 It was awesome to see that my girl was delighted with these chicken wings. Well, of course, she loves anything fried just like me! Thanks to the Airfryer, I can now cook , feed and eat the same great tasting fried food minus the guilt. It has been long since I cooked with a whole duck so one day when I was feeling more adventurous, I bought one at the supermarket and wanted to try out a new way of cooking it. Since it was a huge duck, I decided to halve it and used one half for cooking Salted Vegetable and Duck Soup, while the other half went into the Airfryer. Thanks to the additional capacity of the Avance XL collection, yes it could fit inside comfortably. I must admit, my initial plan was to make a crispy duck but my final product turned out to be a Roast Duck. Since it tasted delicious and was a new addition to the dinner table, I guess no one was complaining. Put 500ml of water, the wine, vinegar, soy sauce, honey and ginger in a pan large enough to hold the duck and bring to boil. Add the cornflour paste and stir until thickened. Place the duck in the simmering sauce and spoon the mixture over repeatedly for about five minutes. Put a skewer through the duck and let dry overnight at room temperature. Rub the five spice powder and salt evenly over the duck, wrap in aluminium foil and airfry at 200°C for 45-55 minutes. Check at intervals and five minutes before it is done, apply a coat of honey. For those who are keener on crispy duck, you might try without the foil and airfry at 160°C for the first 30 minutes and increase to 180°C for the next 30 minutes. The result? I loved the skin and was pleasantly surprised to see that the meat remained juicy and succulent. It might not be the best roast duck around but the hubby gave me ten points for effort and was so appreciative during that dinner that I might just be motivated enough to buy a few more whole ducks home soon. Back by popular demand, or so we'd like to think, Chef Angel decides to try out a new recipe in the kitchen. This time round, she is going to make Chocolate Apple Cupcakes. You know why I love this recipe? It is because all I need to do is to pop the ingredients into my trusty Philips food processor, blend until well combined, scrape sides and spoon into cupcake moulds. We like to use an ice cream scoop so that the portion is consistent. Airfry at 160°C for 15-20 minutes and do a cake test to ensure that skewer comes out clean. Easy, right? I have to tell you, I love the taste of these cupcakes! The cocoa and apple combine to give such a pleasant aroma that I can easily finish this whole plate for dessert. Initially, I only wanted to sprinkle some icing sugar on top but then decided it would be a good chance for Chef Angel to play around with the decorating icing and put her skills to a test. Of course, she painstakingly did just a couple before she discovered that tossing the rainbow sprinkles was much more fun instead. These might not be the best looking or best tasting cupcakes, but they are the first bunch that my girl played a big part in making and you bet I am mighty proud of them. So there, breakfast, lunch, dinner, dessert, we have them all, thanks to the Philips Avance XL Airfryer. With the festive season around the corner, it feels awesome to know that while we might indulge and feast once in a while, healthy eating at home still remain as an important part of our lives. 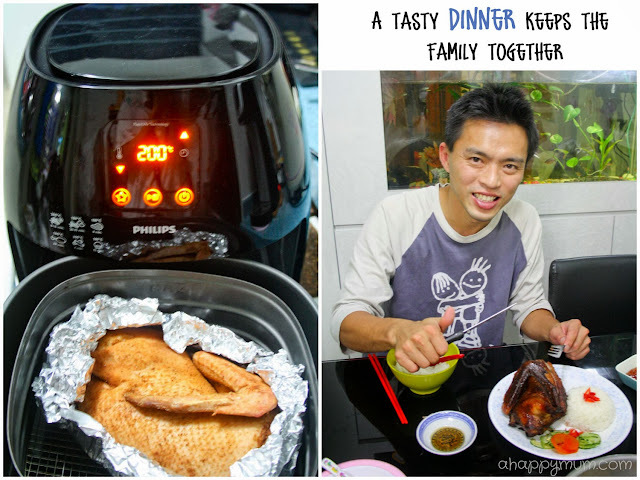 Keep life simple with the Philips Avance Collection Airfryer XL with Rapid Air technology (S$539). Available in stores in December 2013 at leading electronics and departmental stores. 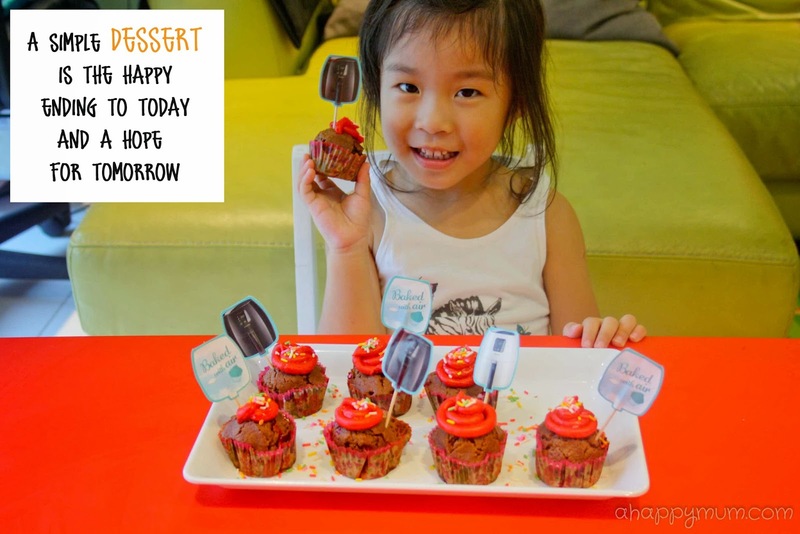 Cook with Air today! 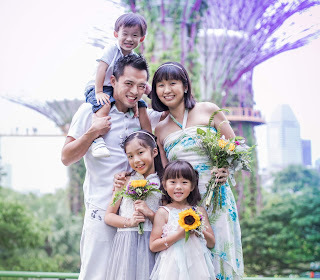 Quote A Happy Mum and buy Viva Digital Airfryer at $399 + $50 shopping voucher (Usual price: $459) and Avance XL Airfryer at $479 + $50 shopping voucher (Usual price: $539) at the PHILIPS EXPERIENCE SHOWROOM. This promotion is valid from 1st December till 31st January 2014. The Viva Digital Airfryer and Avance XL Airfryer are also available at regular price in leading electronics stores, departmental stores and supermarkets island-wide. *Limited to 1 Airfryer per person (IC must be produced). Opening Hours: Monday to Friday: 9.00 am – 7.00 pm Saturday: 9.00 am – 1.00 pm. 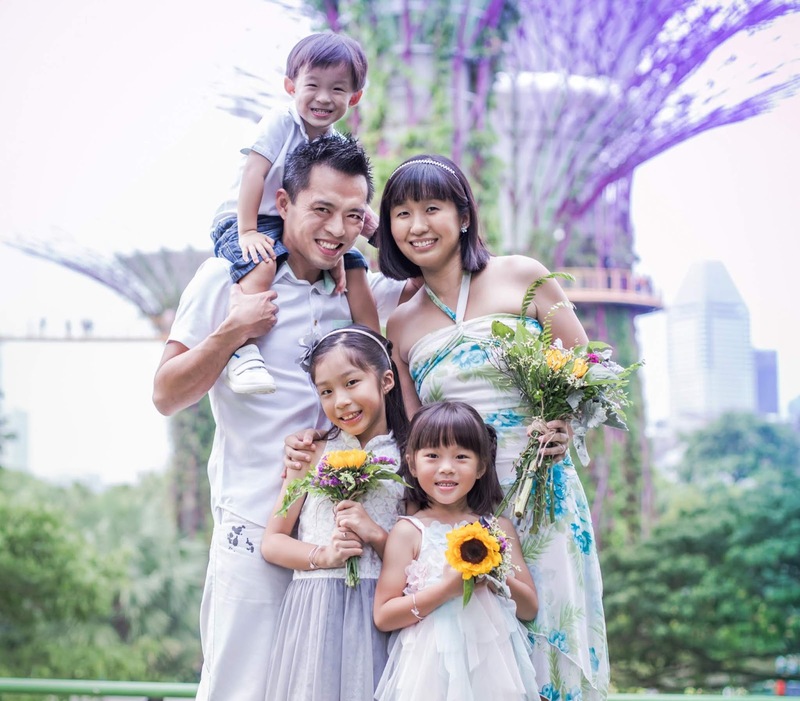 Disclosure: This is part of a series of sponsored conversations between Philips Singapore and A Happy Mum. All opinions are our own. With the Philips Avance XL Airfryer, my family can eat heathier and my kitchen will be cleaner as there is less oil used. cleanup is a breeze. We are eating healthier now, and the food tastes amazing.